I have to admit that I have currently no idea what the maximum temperature inside the Lugano reactor would have been. It depends on the temperatures and we don't know if the reported ones are correct. All this for that therefore thanks to your work. My own estimation is nickel particles couln't be melted and AR uses a trick to do a large amount of H monoatomic ( as said Focardi) as Japanese researchers done by adding a few Pd atoms onto Ni particles ( spillover effect). By the way, since we have been recently revisiting ancient Rossi tests, I tried to align "Test 2" water temperature and power data from the January 2011 Levi report here into a single graph. Further tweaks are of course possible. I am totally an amateur in the LENR mechanisms. However if Palladium was added, it should, having mass number 106 shown up in the fuel analyzis of the Lugano ash. And I do not see a clear signal above the noise. My guess would be that Germanium (mass number 73) was added to create the monoatomic H.
To help an amateur, therefore, to update his knowledges . Japanese teams added Palladium, so AR adds iron oxides to do the same. An advantage of having digitized the data from that old January 2011 test is being able to perform cumulative energy in and out calculations, which I attempted out of curiosity, but I don't guarantee that everything is correct (either way, see the attached graph). I've never had a detailed look at the data from that test before. A water mass flow rate of 146 g per 30 seconds or in other words 4.87 g/s is suggested for Test 2, which is not very much. I think the main issue here is the assumption that it was a constant rate. EDIT: but I seem to recall that there were issues with the claimed flow rate being too much for the pump used during for the test, so it might be more complicated. The post was edited 1 time, last by can ( Jul 2nd 2018 ). The dummy run recalculation of the Lugano report presented here is based on the assumption that correct emssivities settings where used for the Optris temperature measurements and thus that the reported temperatures for the dummy run in the report where correct. The spreadsheet with the calulations is included to this post as an attachment. Where possible I have made the calculations dependent on the values of variables in the spreadsheet so that changes in those values can be evaluated by the reader. I intend to make the same calculations also for the case that the Lugano testers used wrong emissivities on their Optris thermal camera. If those calculations become available will publish them also in this thread. The Lugano dummy run recalculation did include the following calculation changes when compared to the original Lugano report. Additional information on these calculation changes can be found in earlier posts in this thread. For the stacked tubes convective heat transfer a correction factor of .561 was used instead of the factor .667 (2/3) in the Lugano report. This new correction factor was obtained by analysing information obtained from a photograph of the Lugano set up. based on the photograph it was calculated that the rods where equilateral stacked with a distance of 1 mm between the tubes. The emissivity of the finned area was corrected by a factor calculated from the formula as derived from the infinite reflection method. The Lugano testers used for the their radiated heat calculation of the finned area of the ECAT the area of the bare tube. They seem not to have been aware that they should have used the view factor in combination with the total fin area. As a consequence they must not have know the effect of the view factor on their calculations, both for the area and the emissivity. Not taking into account the effect of the view factor on the emissivity, the measured temperatures given by the Optris of the finned area are somewhat higher then the real temperatures. Therefore the temperatures measured by the Optris of the finned area need to be corrected to their somewhat lower real values. The power of the finned area is calculated with the adjusted temperatures (see point 5) , corrected emissivities and effective area. The fin efficiency correction was omitted since the average Optris temperature of the measured areas already took care for this correction. The Lugano test team calculated the Joule heating as being 6.7 Watt, but rounded this to 7 Watt. They also calculated that since the interconnections cables extended for a short distance into the rods, that the Joule power generated in the rods was .4 watt. Thus the external Joule heating was 6.7 -.4 = 6.3 watt. This is the value used in the recalculation. Broad band emissivities where taken from the same curve as presented in plot 1 of the Lugano report. New revision since the original version calculated the power of the rods wrongly because it considered only one set of rods instead of two. Thanks for your hard work. I haven't had a chance to review your spreadsheet, yet. However, the assumption that the reported temperature for the dummy is correct, is weak. If the recursive method was used, as explicitly explained in the report, then the result is almost certainly wrong, except perhaps by accident. The recursive method as explained in the Lugano report simply arrives at a point on the Plot 1 curve through a feedback effect working the total emissivity against the Optris spectral sensivity band emissivity. What is more peculiar is that this faulty recursive method was used at all when the camera was also being calibrated by comparison with the special 0.95 emissivity "dots". The standard dots supplied by Optris and some other IR camera companies cannot withstand the maximum temperatures the dummy was reported to be operated at, so they could only be applicable to the cooler rods, and possibly the caps. This means that the main tube is where the recursive method was applied for the reported temperatures for the dummy part of the test. The method distorts any temperature-emissivity relationship run through it except the cases where the emissivity is the same for both total for the object and the sensitive band of the camera. I think that I can say that, in general, any time the recursive method is used and the object total emissivity vs temperature curve (or any curve of any temperature vs emissivity values) emissivity value is lower than the true camera emissivity value at the same temperature, the result is that the final temperature results are inflated from their actual value. Also, the Joule heating value in the report is wrong, since the equation used for the C2 cables in the report is incorrect. A delta configuration has a specific formula for resistances within the delta, since the conduction periods cause the current within the each leg of the delta connected to a supply cable to be larger than 1/2 that of the supply leads for each phase. (The C2 cables are technically within the delta, while the C1 cables are outside the delta). It is not a large discrepancy in the dummy, but is significant in the Active Runs. Never mind that Rossi spouted an angry series of paragraphs invoking Kirchhoff's law on JoNP, defending the error in the report, instead of owning up to the error. (For the bored or merely curious, compare Rossi's C2 cable rant to the emissivity rant by a "professor" Bert Abbing who posted on JoNP defending the "correct" use of total emissivity for the IR camera). Nice work. Your graphs are the basis for understanding the January 2011 test, that is the first public act of the Ecat saga. A must to understand all the rest. The energy graph is the most significant, but you have made a couple of too much generous hypotheses. First, by attributing a 16.7% mass fraction to the output steam. In reality, the dryness of the steam was not measured, so the correct conservative hypothesis should have been that the outgoing fluid was only boiling water with negligible vapor content, as in your orange curve. Secondly, in your second graph, the outgoing energy exceeds the input electric energy (the blue curve), because you made the calculation on the basis of the coolant flow rate declared in the Levi's report, i.e. 146 g in 30 s. But these numbers correspond to 17.5 kg/h, while the max flow rate of the pump was 12 kg/h only, when operated at the full speed of 100 strokes/min, and at the maximum volume of 2 cm3/stroke. Moreover, the pump was operated at a pace lower than 60 strokes/min, therefore - even assuming that the stroke volume was set at its maximum value of 2 cm3/stroke, which is very hard to believe - the coolant flow rate couldn't have been greater than 7.2 kg/h, that is about 40% of the value declared in the calorimetric report. 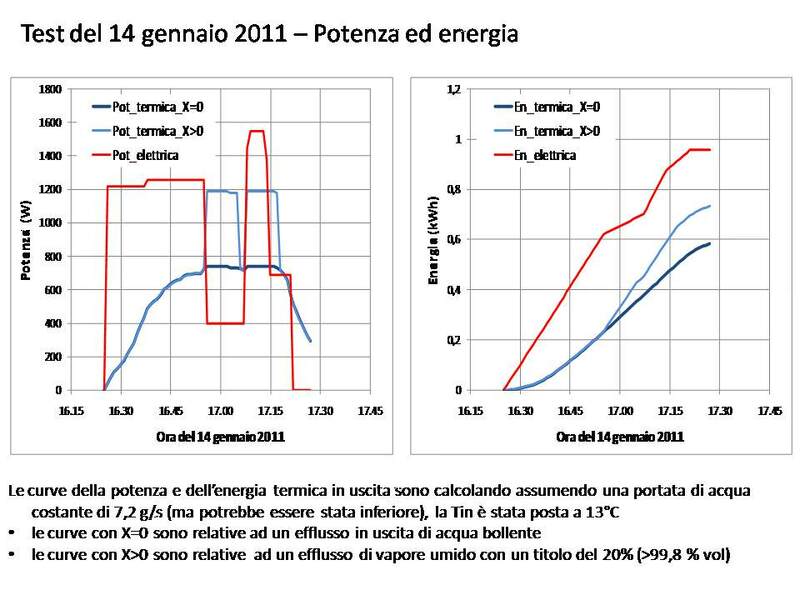 Considering this corrected flow rate, the power and energy curves appear as those shown in the following graphs, which I posted on the Italian website EnergeticAmbiente in November 2011. As for the input electric energy, the red curve of my second graph is identical (after the unit conversion) to the blue curve of your energy graph. Regarding the thermal output energy, my dark blue curve corresponds to your orange curve, but it is 60% lower because it has been calculated by using the max credible rate of the coolant flow. Finally, my light blue curve corresponds to your red one, assuming a 12% of dry steam (in mass) vs. your 16.7%. In conclusion, when examined in the light of these energy graphs, it becomes clear that the device tested in the January 2011 demo was nothing else than an electric boiler, that a group of people (in Bologna as well as in the US) wanted to make the public believe that was a nuclear reactor. To the mods. Given the importance of the first public demo, and since it has nothing to do with the current comments on Rossi-Blog, I would suggest to move this topic (starting from *can* comment #4849) in a specific new thread devoted to discuss the "January 14, 2011 demo on the Ecat, and other early tests". Now that I have the data and the code ready I could make these changes easily. On a related note, several months ago Alan Fletcher purchased a similar dosimetric pump rated for 32 Kg/h, as used by Rossi in his tests. Rossi claimed a much higher flow than rated. I haven't followed his testing very closely (so I could be wrong in my intepretation), but it turns out from Alan Fletcher's experimentation that when the pump is operated significant below 1 bar of backpressure, higher flows can be attainable, in practice even as much as twice the rated rate when the pump operates with a slightly negative backpressure. So, regarding the pump it depends on its operating conditions, it seems. Under non-standard, non-recommended conditions the actual flow rate might be larger than expected. Of course several other oddities in the report remain despite this. Alan Smith ? Shane D. ? AlainCo ? Can, my eyesight is no longer good enough (macular degeneration) to read the key headings on your graph. Your conclusions would be appreciated. You can find really big graphs in the attached zip file. According to Galantini (in 2011) chimney pressure always remained at atmospheric pressure. [...] Confermo che la temperatura misurata è sempre stata maggiore di 100,1°C e che la pressione misurata nel camino è sempre risultata essere pari alla pressione ambiente. I confirm that the measured temperature has always been greater than 100.1 ° C and that the pressure measured in the chimney has always been equal to the ambient pressure. In addition to the above calculation I can say that some preliminary FEM simulations of the dogbone i did in the past showed that the calculated temperatures where already in close agreement with those reported in the Lugano report. If the temperatures in the report where inflated then the FEM simulations should have shown lower temperatures then those in the Lugano report. Please, try also to redraw the graph after having reduced the coolant flow rate to 7.2 kg/h. You will obtain more realistic curves. On a related note, several months ago Alan Fletcher purchased a similar dosimetric pump rated for 32 Kg/h, as used by Rossi in his tests. Rossi claimed a much higher flow than rated. […] So, regarding the pump it depends on its operating conditions, it seems. Under non-standard, non-recommended conditions the actual flow rate might be larger than expected. It's not a matter of what declared by Rossi, or tested by Fletcher. It doesn't work this way. The calometric report on the January 2011 demo was issued with the logo of the University of Bologna, and its Physic Department took the entire responsibility on its content. Considering the exceptional importance of what reported in that document, it should have been written in a professional way, including make, model number and nominal characteristics of all the experimental equipment. But the author of the report omitted to indicate the nominal performances of the pump, despite they were indicated on an big label placed on its front panel. Think about it. He omitted to declare an experimental datum (the maximum nominal flow rate of the pump) that would have been clearly in contradiction with the values he reported. Do you think that this behavior is admissible when a public University is claiming to have tested a device capable to produce 12 kW of heat with an electric input of 1 kW? So, please, tell me. How is it possible that, before the test, Levi said he thought the pump was delivering 12 kg/h, but in his document reported a flow rate equivalent to 17.5 kg/h? How is it possible if after the test he declared that "the pump was not touched and […] it was giving the same quantity of water during all the experiment"? You're trying to make it a matter of principle, but the fact that dosing pumps operated below the recommended backpressure might not work as intended more easily and simply explains how the flow rate could have been much larger than stated by the manufacturer. [...] Do you think that this behavior is admissible when a public University is claiming to have tested a device capable to produce 12 kW of heat with an electric input of 1 kW? [...] So, please, tell me. How is it possible that, before the test, Levi said he thought the pump was delivering 12 kg/h, but in his document reported a flow rate equivalent to 17.5 kg/h? How is it possible if after the test he declared that "the pump was not touched and […] it was giving the same quantity of water during all the experiment"? A possible explanation: he had been thinking all along in grams/second because it's more convenient for calculations and it's what he measured by actually weighting the water, but couldn't give on the spot, when questioned, the value in a more "user friendly" format, so he quoted the manufacturer's without paying too much attention. I have to admit that there was an error in the spreadsheet I published. The power of the rods was not multiplied by 2, since we have two sets of rods. It will now be very interesting to see what the calculation with the inflated temperatures is going to bring us. Thanks. Very nice and realistic curves. Let's assume for a while that that is true. Now consider, please, the following longer excerpt from the already cited Levi's interviews (1): “The flow rate was 146 g in 30 seconds. Using a simple measurement gives a simple result. There was a pump putting in a constant flux and what I have done is – with the reactor completely off take measurements – we spent two weeks of the water that flowing through the system to be certain of our calibration. After this calibration period I have checked that the pump was not touched and when we brought it here for the experiment it was giving the same quantity of water during all the experiment." Could you, please, provide a reasonable explanation why the UniBo physicists spent two weeks for calibrating a dosing pump - devoted to cool a potentially dangerous nuclear reactor - in such a way that the pump would have "operated below the recommended backpressure", so that "it might not work as intended"? Exactly. Villa wrote a nice and professional report, in which he stated that there were no gamma radiations, no exceptional result. But his report was issued on the same day of the Levi's, and the calorimetric report was the final outcome of a cooperative effort performed by many people in Bologna and in USA. How is it possible that only the document that reported those really exceptional calorimetric results was of such poor quality? Are you suggesting that for two weeks they (Levi and somebody else) calibrated the pump in such a way that it would have delivered 146 g in 30 seconds, but they never multiplied the mass by 120/1000 in order to get a value directly comparable with the nominal maximum outflow of the pump, noticing that it was delivering almost 50% more? Could you please draw the 2 curves of the differences between the input electric power and the thermal output with (red) and w/o (orange) the vaporization? They should roughly correspond to the latent heat stored in Ecat (metal + water), plus the heat lost through its external walls. It almost sounds like they wanted to make sure that the pump could work consistently and reliably under their testing conditions—which it apparently did. We can imagine that at that point they deemed the pump suitable for cooling the "potentially dangerous nuclear reactor" (that you don't think it is). Levi's looks like a quick informal report, not really a proper paper. He's also the only author listed. I recall he initially planned to do a more complete and proper job later on with his colleagues as part of the UniBo research program that was supposed to be paid by EFA/Rossi and eventually never happened. I haven't investigated in depth at how Levi usually works. It could be he felt that only roughly assessing the order of magnitude of what he thought he was seeing would be sufficient for a preliminary report that would be soon superseded by a more complete and formal paper, and he certainly didn't expect the Spanish Inquisition to pick apart every single detail yet. This is quite apparent from the early 2011 video interviews, he almost sounds naïve (I do not mean this in a derogatory manner). By the way, along the previous discussion, 8 minutes after the heating resistors were turned on in the January 2011 test, there was a change in the water heating rate (to about twice the rate) where Villa noted that the H2 bottle was opened, even though power to the heaters remained roughly stationary. If this was only due to chemical heating and no LENR, then it means that also other processes than Joule heating were contributing to the temperature changes observed during the test. A similar opposite change is also visible at the end of the test (53 minutes into the test) when the H2 bottle was closed. How is it possible that only the document that reported those really exceptional calorimetric results was of such poor quality? It looks like this was addressed in June 2011 by Levi himself, which confirms what I recalled. Google Translate works well for the rest of the interview. Una critica da parte nostra: la documentazione dei test è inadeguata. L’unico test con dei report scritti non ha i dati disponibili, e su quelli successivi ci sono solo indiscrezioni. Levi: Se avessi avuto in mano tutti i dati per fare una pubblicazione scientifica con tutti i crismi a questo punto non avreste visto un report ma un articolo su Physical Review. L’evento del 14 gennaio è stato fatto soprattutto per Sergio Focardi, che essendo anziano temeva di non arrivare neanche ad annunciare la cosa ai colleghi; allora uno fa con quello che ha in mano in quel momento. Facendo con quello che uno ha in mano in quel momento ci siamo accontentati di queste evidenze. Le altre indiscrezioni riguardano prove tecniche interne, anche se i grafici parlano chiaro: se volete posso trasmettervi i dati. Quello che produrrà i report completi sarà tutta l’attività sperimentale che da questo momento si farà. Ci vorrà parecchio tempo e sarà una cosa estremamente seria. Parliamo di questo, allora. Tutti gli esperti che hanno assistito ai primi test (i fisici Hanno Essèn e Sven Kullander, il giornalista svedese Mats Lewan, il direttore dell’INFN Antonio Zoccoli, e a questo punto anche Krivit) concordano sulla necessità di test definitivi. C’è anche un accordo di ricerca tra Rossi e l’Università di Bologna. A che punto è la trafila? Levi: Attendo a ore la copia firmata da Rossi, mi ha detto che oggi [20 giugno] me la manda. È stato già approvato in dipartimento ed è già stato firmato dal nostro direttore, quindi è ormai questione di ore. Ci saranno poi tempi tecnici amministrativi, le solite cose, comunque l’accordo c’è. A criticism from us: the documentation of the tests is inadequate. The only test with written reports does not have the data available, and on the subsequent ones there are only rumors. Levi: If I had in hand all the data to make a scientific publication with all the conditions at this point you would not have seen a report but an article on Physical Review. The event of January 14 was made especially for Sergio Focardi, who, as an elderly man, was afraid of not even going to announce it to his colleagues; then one does with what he has in his hand at that moment. By doing with what one has in hand at that moment we have settled for this evidence. The other rumors concern internal technical tests, even if the graphs are clear: if you want I can transmit the data. What will produce the complete reports will be all the experimental activity that will be done from this moment. It will take a long time and it will be extremely serious. Let's talk about this, then. All the experts who witnessed the first tests (physicists Hanno Essèn and Sven Kullander, the Swedish journalist Mats Lewan, the INFN director Antonio Zoccoli, and at this point Krivit too) agree on the need for definitive tests. There is also a research agreement between Rossi and the University of Bologna. At what point is [this process]? Levi: I look forward to the copy signed by Rossi, he told me that today [20 June] sent it to me. It has already been approved in the department and has already been signed by our director, so it is now a matter of hours. Then there will be administrative technical times, the usual things, however the agreement is there. The amount of temperature inflation caused by the recursive emissivity method may not be large for the dummy, but it certainly going to be there, since the method was used. The Kapton emissivity stickers (dots) melt (the glue at least) at 380 C, and they cannot be used on the ribbed surface, so IR calibration with a standardized emissivity is not possible at ~ 450 C.